ETF Global: Fall 2016 ETF Global® Portfolio Challenge - Calling All Undergraduate and Graduate Students! 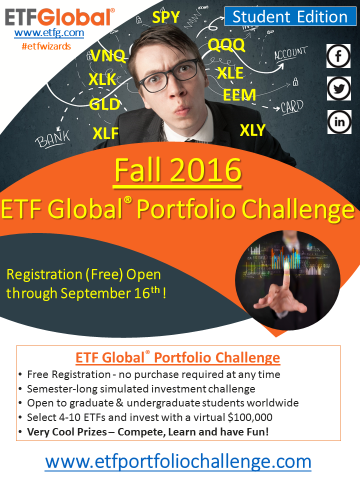 Fall 2016 ETF Global® Portfolio Challenge - Calling All Undergraduate and Graduate Students! Now in its second year, the ETF Global® Portfolio Challenge provides college students worldwide the opportunity to vie against their fellow classmates and other schools for some very cool prizes intended to benefit both their education and careers. The contest is FREE and requires no purchase at any time. Each student constructs their own virtual portfolio of ETFs and competes on its performance throughout this school semester. Any and all Undergraduate and Graduate students can sign up at www.etfportfoliochallenge.com through September 16th. We wish our players all the best in this virtual investment competition and thank you for reading ETF Global Perspectives!